Continental is introducing two new tire technology concepts that will make for even greater road safety and comfort in the future. The two systems enable continuous monitoring of the tire’s condition, as well as situation-matched adaptation of tire performance characteristics to prevailing road conditions. The technologies, called ContiSense and ContiAdapt, will make their public debut at the 2017 Frankfurt Motor Show (IAA) accompanied by a tire study. ContiSense is based on the development of electrically conductive rubber compounds that enable electric signals to be sent from a sensor in the tire to a receiver in the car. Rubber-based sensors continuously monitor both tread depth and temperature. If the measured values are above or below predefined limits, the system at once alerts the driver. If anything penetrates the tread, a circuit in the tire is closed, also triggering an immediate warning for the driver – faster than the systems used to date, which only warn the driver when the tire pressure has already begun to fall. In the future, the ContiSense system will feature additional sensors that can also be utilized individually. Thus information about the road surface, such as its temperature or the presence of snow, can be “felt” by the tire and passed on to the driver. The data can be transmitted to the vehicle electronics or via bluetooth to a smartphone. ContiAdapt combines micro-compressors integrated into the wheel to adjust the tire pressure with a variable-width rim. The system can thus modify the size of the contact patch, which under different road conditions is a decisive factor for both safety and comfort. Four different combinations allow perfect adaptation to wet, uneven, slippery and normal conditions. For example, a smaller contact patch combined with high tire pressure make for low rolling resistance and energy-efficient driving on smooth, dry roads. By contrast, the combination of a larger contact patch with lower tire pressure delivers ideal grip on slippery roads. The system also permits very low tire pressures of below 1 bar to be set, to help ease the vehicle out of a parking space in deep snow, for example, or traverse a dangerous stretch of black ice. 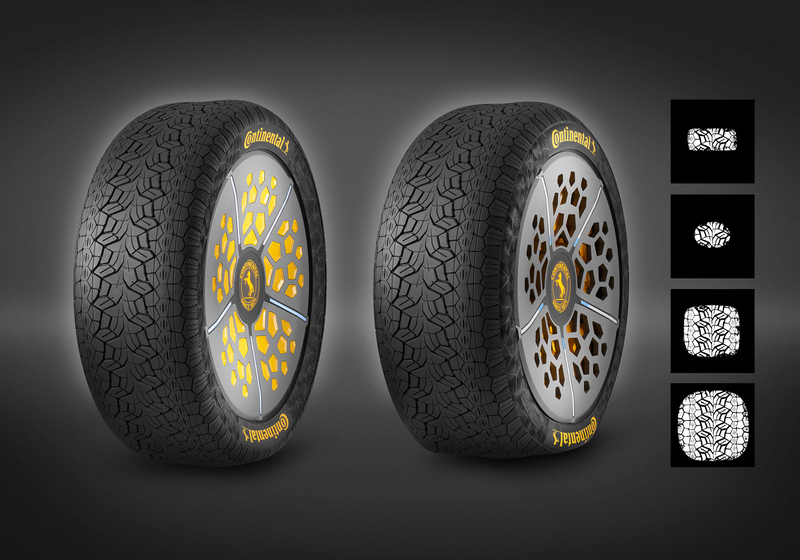 ContiSense and ContiAdapt are joined by a concept tire that enables the benefits of both systems to be fully leveraged. The tire design features three different tread zones for driving on wet, slippery or dry surfaces. Depending on the tire pressure and rim width, different tread zones are activated and the concept tire adopts the required “footprint” in each case. In this way, the tire characteristics adapt to the prevailing road conditions or driver preferences. Continental considers both these tire technology concepts promising solutions for the mobility of the future as tires are adapted to meet the needs of automated driving and electrification. Low rolling resistance, for example, makes it possible for electric cars to cover greater distances on a single charge. At the same time, the tires can be adapted to suit the driver’s personal preferences or in response to sudden changes in the weather. These concepts are the logical next step in the future-oriented development of the REDI sensor, brought to market by Continental in 2014, which was instrumental in establishing smart communication between vehicle and tire. The new tire technology concepts follow on from the two established mobility technologies ContiSeal, for the automatic sealing of punctures, and ContiSilent, for a tangible reduction in tire/road noise. Able to draw on more than a century of experience in tire technology and with in-house expertise in the fields of vehicle electronics and automotive IT, Continental is systematically aligning its products with the future requirements of autonomous driving and electric mobility.